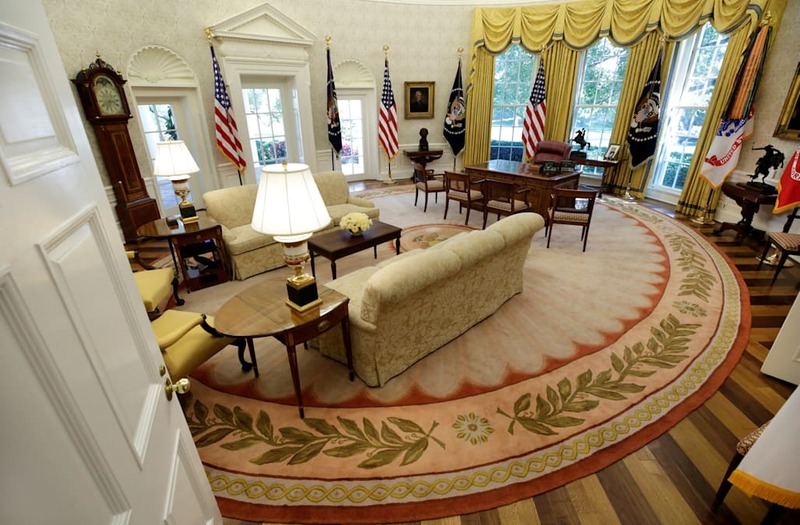 President Donald Trump's administration is spending $1.75 million dollars on new furniture and redecorating for the Oval Office and other executive office spaces, according to a new NBC News report. The report cites government records that include $17,000 for custom rugs and $12,800 for a custom-made conference table. "Furniture pedestals" costing $7,000 and $5,000 for wallpaper were also listed. A large chunk of the spending is going toward new furniture for federal employees working in building around the White House. For example, $291,000 is listed on a receipt from an office wall vendor for the U.S. Trade Representative office. Another contract for $240,000 from September is for "wood office furniture manufacturing" from a Virginia-based furniture dealer, and $29,000 was spent on "upholstered household furniture manufacturing." The president found himself in another controversy when it was reported he called the White House "a real dump." He strongly denied those reports and tweeted a response, calling the White House "one of the beautiful buildings (homes) I have ever seen." Trump had spent more than double on White House furniture by June of his presidency than Obama during his first few months in office, according to one report. However, the Obama administration did make up for their slow start. Trump's current spending is only slightly more than Obama's spending of $1.5 million over a similar period during his first year in office.